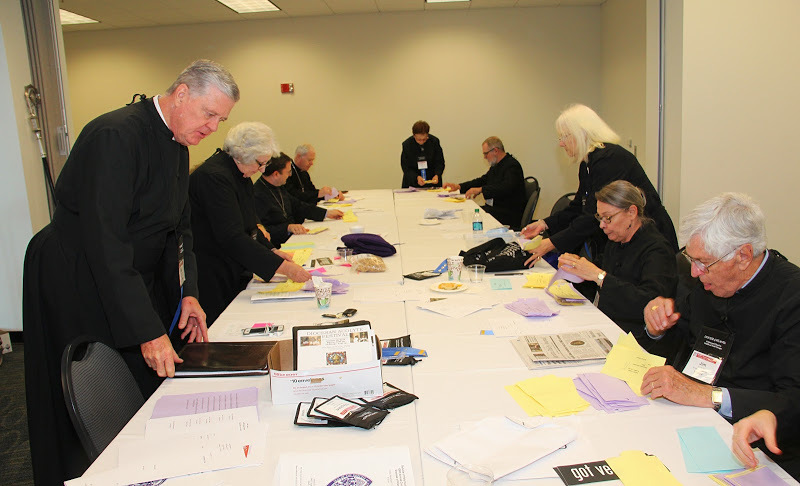 The 109th annual Diocesan Council met Nov. 13 and 14, 2015, at the Infinite Energy Center (Gwinnett Conference Center) with more than 500 clergy and lay delegates attending. Members of our Verger Chapter played a significant role in facilitating the meeting by leading the opening worship service, serving as tellers, and other miscellaneous duties. Vergers who volunteered to serve as Tellers included Head Teller Karl Sachsenmaier (Cathedral of St. Philip), Martha-Sue Blythe (St. Martin’s), Robin Dake (St. Matthias'), Paul Davison (St. Christopher's), John Haeger (Christ Church – Norcross), Cheryl Josephson (St. Martin’s), Phillip Knight (St. Teresa's), Jim Landers (St. David’s), Jim Parks (St. James’), Ken Singleton (St. Paul’s – Atlanta), Linda Salmons (St. David’s), Ruth Anne Tatum (St. Martin’s), Lorie Tola (St. Patrick’s), and Kathryn Turman (St. Patrick’s). Pictured from left to right: Karl Sachsenmaier, Linda Salmons, Paul Davison, Jim Landers, Martha-Sue Blythe, Phillip Knight, Ruth Anne Tatum, Kathryn Turman, and Jim Parks. For additional photos of Tellers in action, courtesy of Bill Monk, click here. Lorie Tola and Cheryl Josephson staff the Verger Display Table. Please notice the brand new MEG Chapter Banner.